Photo Caption: Top Row from Left - Dawrn Reinhardt and Eileen Ryan. Bottom Row from Left - Emily Wilcox and Jennifer Dooper. In 2009, WKU was named one of the top U.S. producers of Fulbright students, among Master’s degree-granting institutions. 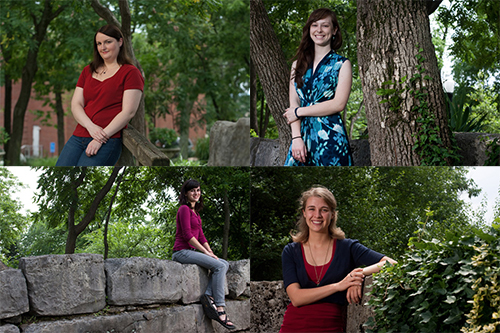 This year, four WKU graduates–Jennifer Dooper, Dawn Reinhardt, Eileen Ryan and Emily Wilcox–have been awarded 2010-2011 Fulbright grants. All four are graduates of the University Honors College, and of departments within WKU’s Potter College of Arts & Letters. Dooper, Ryan and Wilcox will be teaching English in Argentina, South Korea and Indonesia, respectively, while Reinhardt will travel to Germany on a research grant in German literature and language, the U.S. Department of State and the J. William Fulbright Foreign Scholarship Board announced recently. A double major in German and English, Dawn Reinhardt will spend a year in Munich, researching sixteenth century German Teufelsbucher, or “Devil Books,” and taking classes at the second largest university in Germany, Ludwig-Maximilians Universitat Munchen (Ludwig Maximilian University of Munich). Her project will focus on exploring correlations between the Protestant Reformation and the beginning of the Teufelsbucher genre. Reinhardt, daughter of Robert and Barbara Reinhardt, hails from Crossville, Tenn. Her application was supported by Dr. Laura McGee, Professor of German and interim head of the Modern Languages Department, who applauded Reinhardt’s savvy in laying the groundwork for a successful Fulbright application. Mike and Ruth Ryan of Louisville will be sending their daughter Eileen Ryan across the globe to South Korea to teach English. Ryan completed a double major in Journalism and English. Ryan and Dooper were roommates while at WKU, and applied for Fulbright grants at the same time, though the announcement of ETAs to Argentina was made earlier than for the awards to South Korea. Emily Wilcox, of Louisville received a bachelor’s degree in Art from WKU in 2009; her parents are John and Micki Wilcox. Already a seasoned traveler, having spent four months in both India and South Africa during her undergraduate career, Wilcox welcomed the challenge of applying to teach English in Indonesia, where she is excited to incorporate art into the English language classroom. The ETAs in Indonesia are often placed in rural areas, outside major cities, and so Fulbright looks for applicants they believe to be resourceful and flexible. Another of Wilcox’s art professors, Dr. Guy Jordan, has no doubts she’ll thrive in Indonesia. These four students are among the more than 1,500 U.S. citizens who will travel abroad for the 2010-2011 academic year through the Fulbright U.S. Student Program. For the 2010-2011 cycle, a total of six WKU students applied for Fulbright grants; all four whose applications advanced to the second round were offered grants. Students applying for the Fulbright and other nationally prestigious scholarships work closely with faculty and staff at the Office of Scholar Development, as well as with faculty mentors, such as Potter College professors Arnold, Hovet, Jordan, McGee and Rutledge. The Fulbright Program is the flagship international educational exchange program sponsored by the U.S. government and is designed to increase mutual understanding between the people of the United States and the people of other countries. The primary source of funding for the Fulbright Program is an annual appropriation made by the U.S. Congress to the U.S. Department of State, Bureau of Educational and Cultural Affairs. Participating governments and host institutions, corporations and foundations in foreign countries and in the United States also provide direct and indirect support. Recipients of Fulbright grants are selected on the basis of academic or professional achievement, as well as demonstrated leadership potential in their fields. The Program operates in more than 155 countries worldwide. Since its establishment in 1946 under legislation introduced by the late U.S. Sen. J. William Fulbright of Arkansas, the Fulbright Program has given approximately 300,000 students, scholars, teachers, artists and scientists the opportunity to study, teach and conduct research, exchange ideas and contribute to finding solutions to shared international concerns. For further information about the Fulbright Program or the U.S. Department of State’s Bureau of Educational and Cultural Affairs, visit http://fulbright.state.gov or contact James A. Lawrence, Office of Academic Exchange Programs, telephone 202-632-3241 or e-mail fulbright@state.gov. The Office of Scholar Development is committed to helping students on all campuses and in all majors and degree programs develop the vision, experience and skills to be independent, engaged scholars. Students interested in investigating funding for undergraduate research such as the Barry M. Goldwater scholarships, or postgraduate funding opportunities, including the Fulbright or Rotary Ambassadorial Scholarships, should call to schedule an appointment with the Office of Scholar Development at (270) 745-5043. Contact: Jeanne Sokolowski at (270) 745-2764.